Dance in Balance is suitable for everyone, young and older, it is a dance exercise for the soul. It is intended to reconnect again with the true essence of who you are. Many of us suffer from all kinds of physical and emotional discomfort and perhaps even constraints such as fatigue, vague physical complaints, lack off initiative, anxiety, addictions and compulsive behaviors. In principle there is a conflict between our inner and outer life. “Dance in Balance” is a therapeutic dance form that connects body and soul and balances the energy between them. It is a journey through your seven life sources or energy centers, called chakras. Free movement on a blend of specially composed, rhythmic music brings balance and give you a deep experience of life. The music resonates with each particular chakra. With this combination you’ll discover your deepest feelings and blockages and they will be cleared. To lose contact with our body is the same as becoming spiritually homeless. “Dance in Balance” allows energy to flow again and ignites your spirit. It is a holistic process that can increase feelings of well-being, both physically and mentally. Dance in Balance connects body and soul together and brings balance. It lets you gently unfold and awaken you to who you really are. 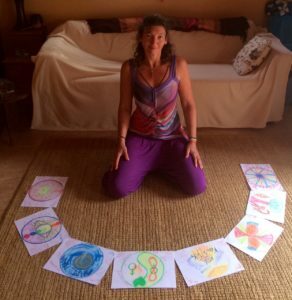 A “Dance in Balance” Workshop includes Dance, Meditation and creating a Mandala. We dance with our eyes closed in subdued light. “Dance in Balance” is all about what you feel and experience, without judgment, so it truly is pure freedom. Your experiences, dance and creativity are not analyzed. The therapeutic aspect is in the dance itself in. The philosophy of this dance is also rooted in the psychology of Carl Jung. The primary goal of Jung is to constantly form a relationship between our unconscious and consciousness to find wholeness and to reach our full potential. This is the purpose of this workshops, to reconnect to your inner powers and give better form to your life. “Dance in Balance” was developed by the Australian Natalie Southgate and introduced in London in 1998. With Natalie combines her experience and training in the field of dance, psychology and chakra healing in a new combination of ancient wisdom. “Dance in Balance” was embraced in 2004 by Deepak Chopra. Meanwhile, thousands of others experience around the world how this workshops unravels any blocked energy and balance, and how it brings you deeper in contact with your authentic self. You just have done this 1 time in your life, to have the experience … . to be repeated. During this introductory workshop you will dance and experience all your seven inner Life Sources (chakras). Accompanied by music and visualisations that resonate with your Life Sources, you are taken on a dynamic dance journey through your own energy centers. A voyage of discovery to your inner powers. No judgment. Pure freedom and enjoy! Allow yourself time to get away from your everyday life and experience the full magic of a Chakradance™ 9 week cycle or a retreat. A weekend or midweek of dance, meditation, reflection, connection and inner growth. A wonderful opportunity for you to experience Life sources (chakras), relax, enjoy, connect with yourself and share with like-minded people. ‘Awakening’ is designed for beginners and for those who practice regularly Chakradance™ and consists of 9 workshops. The first workshop begins with an introduction. Then we focus in depth on a specific Life Source (chakra). At the last workshop, all Life Sources connected with each other during the integration workshop. This cycle will flowing all your seven Living Resources in a gentle manner and balance. By regularly dance your Life Resources and your chakra system, possibly stagnant energy will flow again and you feel vital and energetic. This cycle / retreat brings balance, improve your health and can be accessed for insights. and the different dances …..
Book now a retreat or an 8 weekly cycle and receive a bracelet of your choice! Soon there are also strip maps available for the different cycles. “Surprisingly, overwhelming, awakening and liberating. WOW, what an experience to make this inner journey and to go through all the layers. I noticed that I still had some blockages and felt during the dance huge sensations in my body. When I accept this, I noticed a change, a massive liberation, the great feminine energy, but also the power of the male energy as well be tears of emotion. The different music I loved, my body reacted spontaneously. I’m literally wakes up and be aware of many things that play. This was a super nice present, I have really enjoyed it. It was a very nice experience, worth repeating. This is a 3-hour during workshop, we dance all seven chakras and using completely different music. It starts with an opening meditation, a warm-up dance, and then we dance the seven chakras. There are different versions. The workshop ends with a creative exercise, mandala art or extra meditation and we ending with an integration meditation. The overall feeling of this workshop are dynamic. It’s a nice discovery through your own energy centers! Duration: 3 to 3.5 hours This is including tea and fruit / snack. It is also possible to do the dances and cyclus individually or as a coupling or own group. Do you have problems in your relationship? Dance together is healing and invigorating. Willy (ES) “Dance in balance with Chakradance was a nice experience for me and is something to do more, it brings rest, tranquility and color into your life. It was good, a positive experience. Ruud and Rachel Chakradance was for us a strange experience, partly because you dance with closed eyes. You know that there are no eyes on your aim and thereby moves a lot looser than you would look like others. You can let your feelings go. It is soothing and yet you are active. I dared to dance freely and could totally let me go! After this cycle was our contact become much closer, we came back to ourselves and a lot closer together. Thank you Alexandra! Click on testimonials to read the experiences of those who came before you. ‘Nieuwe voornemens? Dansend kom je er wel!